On this blog, I will be posting things purely related to hacking and cyber-space. Let me ask you one thing : Do you feel like you are the person who knows everything about Internet ? Do you know each and every social networking site on Internet ? Do you know every music related website whether its MOG, Pandora, GrooveShark, Spotify, Zumocast or Last.fm ? Do you know every photo sharing sites like pinterest, Flickr, Instagram, Pixlr or Pixenate ? There are still various categories on the Internet and if we come to know few things, we celebrate saying that we know so much about the Virtual World - The Internet. If your answer was "YES" for the above questions then too you I would say that you have only come across "The Surface Web" which is just 4% of Internet. 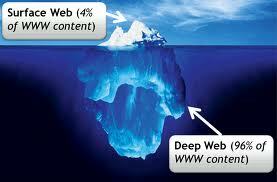 Let me introduce to you "The Deep Web" , the 96% of the Internet. In this world of Cyber-Terrorism and Cyber-Warfare, it is very important to be well known about Internet. In the days when I didn’t knew much about hacking, I heard from somewhere that there are places on the internet which do exists but not many are aware about it. These places are nothing but web-pages and web-services. In those days I failed to give a proper proof as I myself was not clearly confident. But recently I read an eye-opener article (author: Pierluigi Paganini) shared by Robert Rodriguez. This article proved to me that these dark places do exists in the Cyber-World. I would like to share few things from the article which I felt like every internet geek should certainly know. The name given to these inaccessible place is the “The Deep Web”. “Deep Web”, also known as “hidden web”, is a term that evokes the unknown, a mysterious place in the cyber space populated by criminals and hackers that is not accessible to ordinary people. The Deep Web is a collection of information resources located on the World Wide Web not indexed by search engines(The reason behind why they don't appear in search-engine results is properly explained in the article whose reference is at the end of this blog post). The principal characteristic and purpose of the Deep Web is the “anonymity”. At the first instance, looking at the term “anonymity”, you will think that Deep Web is related to Cyber-Criminals. Of course, total anonymity attracts criminal industries that are migrating various activities in the hidden web. In the recent months, the number of underground markets that sell any kind of odd, from drugs to weapons has grown exponentially. Apart from Cyber-Criminals, the Deep Web and the service hidden in its resources are also largely used by governments, in particular by intelligence agencies and military to exchange documents secretly and by journalists to bypass censorship established by dictatorial regimes to suppress internal dissidents. Well, the most popular anonymizing network is Tor, The Onion Router, a system managed by US Naval Research Laboratory from 2004 to 2005 to enable online anonymity. Using a Tor client software, a user is able to surf in Tor Network, which is the best way to navigate in the deep web using Tails OS distribution which is bootable OS that doesn’t leave a trace of user’s machine. Now so you are ready to get into the deep web, make some pre-requisites clear. Once you enter the deep web, it is easy to get lost which is why it is essential to keep in mind the references that can help navigation. One more thing to keep in mind is that you will not find search engines like Google or Bing. Typically, users proceed in the navigation jumping from list of navigable URL proposed by more or less known sites, collection of Wikis and BBS-like sites have the main purpose to aggregate links, categorizing them in more suitable groups of consulting. Another difference that users immediately note is the format of web site URLs.Instead of classic extensions (e.g. .com, .gov) the domains in the Deep Web generally end with the .onion suffix, .onion-URLs are used to identify hidden services. Addresses in the .onion pseudo-TLD are 16-character alpha-semi-numeric hashes which are automatically generated based on a public key when the hidden service is configured. These 16-character hashes can be made up of any letter in the alphabet, and decimal digits beginning with 2 and ending with 7, thus representing an 80-bit number in base32. This .onion-URL isn’t used only to refer the hidden service, it also offers service authentication. Only one specific hidden service is associated to this identifier and no one can forge or spoof it because an 80 bit number actually is a part of the hash of the public key of the hidden service and the public key is strongly related to its private key.Now that reader has understood what the meaning for this strange sequence of characters representative of onion addressed, let provide few interesting info that could allow him to move first step in the obscurity of the Deep Web. Wikies are most precious resources in the Deep Web, especially for those individuals that have no fixed references for their researches, they are collections of URLs related to various topics arranged in categories to improve the consultation. Most popular, but not the only one is the Hidden Wiki, it is a mine of information and links to allow wide researched in the Deep Web. The wiki offer an impressive quantity of URLs related to raw contents and discussion pages. The web site appears very friendly to visitors that once located the section of interest, representative of a specific thematic area, could browse to the links listed. Users could easily find content related to hacking, hacktivism, market places, commercial services and forums and a specific session for services arranged for geographic areas. TorDir is another collection of onion links arranged in various categories such as Business, Hacking and Related and Social. Also, this site is very easy to consult; users can share links registering and adding new ones, the website also proposes a search engine to help users to find resources in the TorNetwork. Another precious resource is“TorLinks | .onion Link List”, an interesting collection of links organized in categories for a very simple consultation. This blog-post was an abstract of the complete article. That is absolutely fascinating. I've wondered for some time about the Dark Net and I also thought it must be difficult to access. Interesting to differentiate what all these terms actually mean too. Curiosity and adventure will get the best of me and I'll have to explore the Dark Net, I'm sure. Very instructive and informative. Thanks. A high-class apple product which facilitates you for video chat with your friends and family is none other than Facetime. The link given above for The Hidden Wiki (http://kpvz7ki2v5agwt35.onion/wiki/index.php/Main_Page) has been changed now. The new link is http://zqktlwi4fecvo6ri.onion/wiki/index.php/Main_Page. It would be helpful, if you can please update this link. JAMIEHACKING99 (AT) Gmail (DOT) COM . It was a very good article on Onion Links. I enjoyed reading your blog post. By the way, I like reading articles on multiple topics. Good article on Onion Links. I enjoyed the articles in your web site. i favor work articles on totally different core interests. i'm super charmed and can examine your web site for an extended time to come back. charming article staying connected with the center. this is often an incredible piece work. I exceptionally endorse this arrangement to everybody. Dark web monitoring tools !To Fight and Stop Dark Web Crimes. Dark web monitoring to track down and secure information which has been “leaked” on Dark Web. Dark web monitoring Protecting your accounts and the future of your credit score.